This week we hit a major milestone on our project to move our ISP e-mail services over to the Google Apps platform - the completion of the first migration to Google. To recap, all new Virgin Media customers setting up e-mail with us have been put onto the Google platform (with @virginmedia.com e-mail addresses) for some time, and this week's completion of the first migration means that all National (ADSL) customers with @virgin.net addresses now have their mailboxes on the Google platform too. This means that customers have much bigger mailboxes, as well as access to features such as chat and search within the webmail interface. Customers have been moved over without any change to their e-mail address (they will be able to choose a @virginmedia.com address at a later date if they wish to) - this is just a change of the platform. The biggest challenge we have expected (and planned for) within the migrations is how customers will react to what is a very different webmail interface from what they were on previously, and we have focused our help and customer communications around this, as well as training up our technical support teams on what some of the most common queries would be. So far we have seen what we expected, with some 80% (well, 81.23% to be precise) of the calls we've had classified in this 'customer education' category as it is known internally. In short, this means helping customers out with how to use the service, where things are, what they are called and the likes. The remainder of the calls have been in a number of different categories - password resets, some of the data integrity work we had to do (which involved some customer communications to anyone affected) and a couple of the minor bugs we found and have plans to resolve ahead of the next migration if not already resolved. We had actually planned for it to take around four weeks, so we're ahead of expectations. In fact we're ahead of expectations generally - the National migration finished 8 days early and all the work is now happening ahead of the next migration, ex-Telewest customers with @blueyonder.co.uk e-mail addresses. In fact the team are already talking about the National migration in the past tense! This weekend a number of technical changes are happening, that enable us to move into some final production testing and then a staff trial ahead of the migrations starting, which is due to happen this side of Christmas and run into next year, when the ex-NTL customers (with @ntlworld.com e-mail addresses) will also move over to Google. Now that we're a good chunk of the way through the 6m mailboxes we are moving to Google and it's going well, it's full steam ahead on the next phase. A big thanks to the exceptional work from our project team, and also to those customers who have taken the time to give us feedback already. In the switch over I did not really appreciate the 900 emails I received through Windows Mail - ones I had sent to other people since 2000. Apologies, that was an unexpected side effect that affected some mailboxes which we are looking into further, but don't expect it to occur on future migrations. A brave step for one so young... I'm sure the cost saving you've made Virgin will go back to the high earners and the credit and plaudits will be missed. I think that email outsourcing is a good idea for smaller companies but taking this step is a massive undertaking to which you now have no control over. Not sure what you mean by "one so young". Outsourcing of messaging services is common amongst larger ISPs around the world and we’ve already gained a lot of experience with email outsourcing from having previously had the virgin.net email platform outsourced to TUCOWS. We spent a lot of time considering how to best unify our legacy email platforms into a single system and we believe that the Google platform gives our customers a great usability experience and also provides a good basis for offering future services based on the platform. It's not correct to assume that the standard SLAs, etc, for Googlemail/Gmail also apply to this service - we have our own contract with Google, as do all partners of the Google Apps ISP Edition service. Congratulations Alex, It's been a long time in the making and I know you guys worked hard on this. 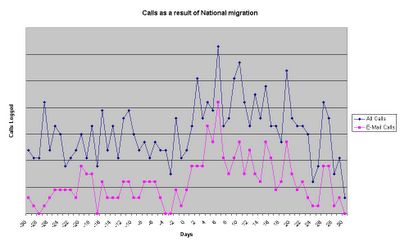 Great to have some visibility of timescales for migration - particularly that ex-Telewest customers are next. Would be nice if this was available "officially" - I know it's a bit of liability to commit to timetables but I'm sure there would be some wooly wording to give customers some info! We'll be e-mailing customers before they're migrated to Google, as we did for the National migrations. You have a fair point on timescales naturally, as there's still final testing to happen on the ex-Telewest scripts before we start the final migrations. However, they are imminent. When will @by be able to switch to @vm? We'll do this once all 3 domains have been moved to Google later this year. More info closer to the time.